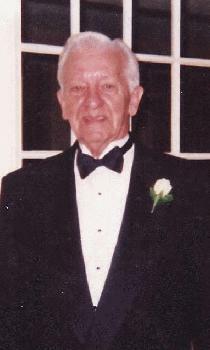 Charles James McMellen age 94 of Greenville passed away Thursday December 27, 2012 at home. He was born in Ionia on June 23, 1918 the son of Edgar Joseph and Albertina (Walker) McMellen. He was a graduate of Ionia High School with the class of 1937 and a veteran of WW II serving in the US Navy on ships in the Pacific. Early in his career he owned a restaurant in Fremont MI and then was president of Gilliland Trucking, owner of the Montgomery Ward franchise in Greenville and then he operated Spartan Industrial in Greenville for many years. He was a long time member of the former Greenville Country Club proudly scoring his age in his later years and making a hole in one. He also loved bowling where he had several 300 series. Charlie was a member of the American Legion Post # 101,Greenville. He married Nora E. Knoff Proctor on October 22,1984. He was preceded in death by his brother Leslie McMellen. He is survived by his wife Nora and his children; David (Cindy) McMellen of Traverse City, Darlene (Dixon) Powers of Dallas, Oregon, Lisa Holmden and Tricia (Mark) Winters both of Greenville, Tamara (Roger) Wenk of Battle Creek and Mary Proctor of Grand Rapids, grandchildren; Matt, Melissa, Chelsea, Jeff, Andrew, Alex, Casey, Spencer, Dustin, Chelsea, Allison, Daniel, John, Jordon and Rachel, two great grandchildren, his sister Marjorie Abbot of Battle Creek, brother-in-law, Donald Knoff of West Liberty, OH, sisters-in-law, Mary Ruth (Leland) Tuttle of Bellefontaine OH and Phyllis Hartzler of West Liberty,OH.